I’ve been toying with the idea for quite some time and for a while almost gave it up thinking red velvet again? I thought that I’ve reached the end of my red velvet waffle journey when I made my yeasted version but realized I have not done it the Liège way- you know, more dense and bread-y like eating a toasty brioche. So I sat down and worked on the two recipes I have to come up with this project. It's not difficult when you have trusted recipes on hand. 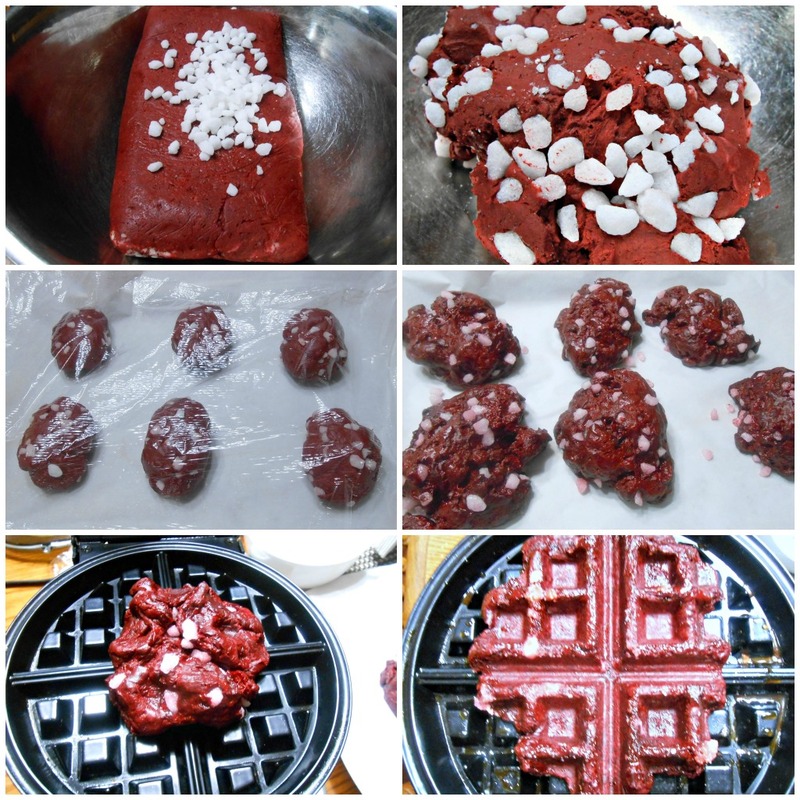 Since I have Liège waffles in mind, I just followed the recipe but incorporated the red velvet aspect- buttermilk, red vegetable food color and unsweetened cocoa powder. 2. 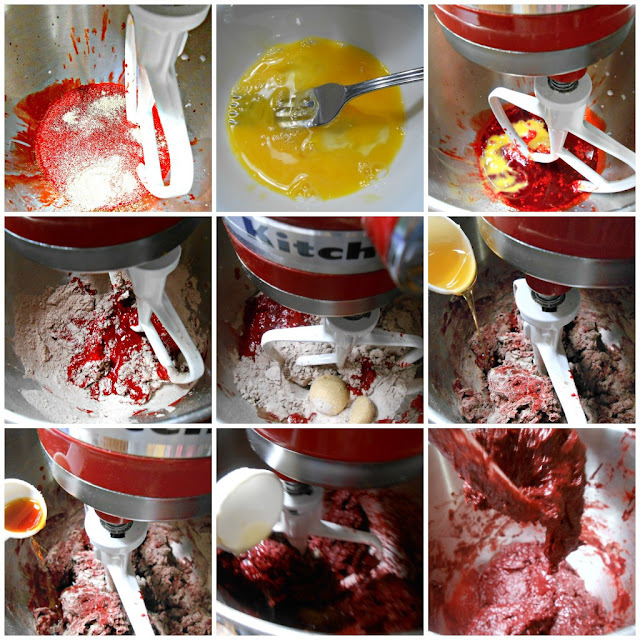 Place yeast, buttermilk, red vegetable food color and water into the work bowl of a stand mixer. Stir for a few seconds to moisten the yeast. 3. Add the egg and 1/3 of the flour mix. Mix to blend. Scrape down sides of bowl. 4. Add brown sugar to the work bowl and mix on low speed just to blend. 9. The next day, place the cold dough (it will be quite firm) in a large bowl and add all of the pearl sugar to a bowl. It will seem like a lot of sugar, but it’s supposed to be mixed into the dough by hand until the chunks are well distributed. Divide the dough into 5 pieces of equal size- I did six though because I think five is too big and used more sugar pearl this time because the batter itself hardly used sweetener except for a tablespoon honey and a little brown sugar. Like the regular Liège waffles from an earlier post, some sugar pearls didn't melt and just stuck to the waffles but no worries, these are brittle and will not ruin your teeth. Instead of cream cheese frosting, I decided to make cream anglaise sauce with cream cheese to keep the tradition. 1.Warm the milk or cream in the sauce pan and remove from heat. 2. 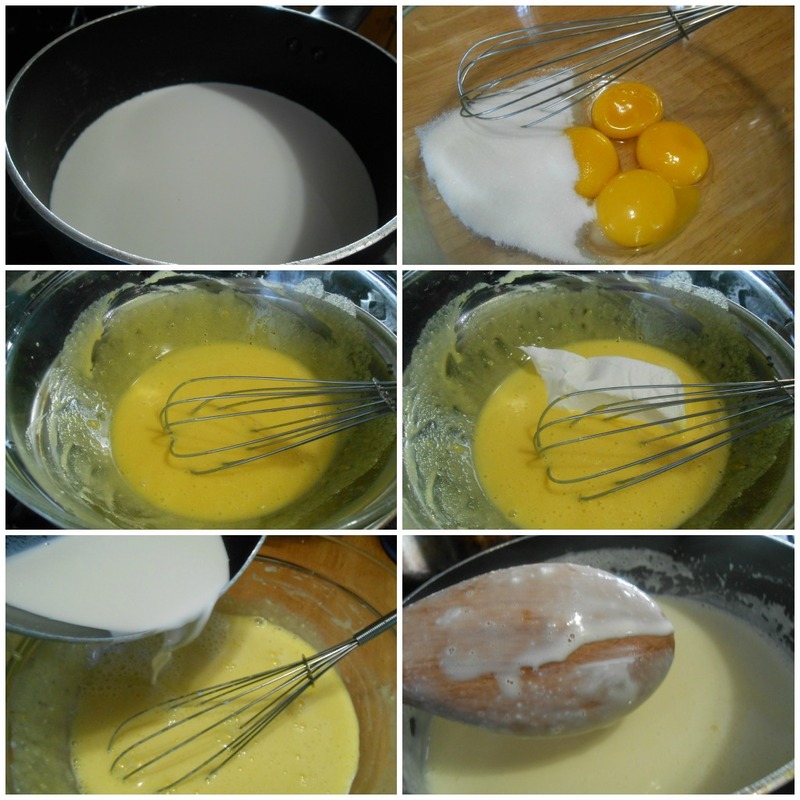 In a medium, heat-proof bowl, whisk the yolks together and then whisk in the sugar then the cream cheese. Continue whisking until the mixture turns pale yellow and forms ribbons on the surface. 3. While whisking steadily, pour the milk into the egg-sugar mixture in a steady stream. 4. Pour the mixture back into the sauce pan and set over medium heat. Stir constantly to make sure the bottom does not burn or the eggs curdle. 5. Continue stirring until the mixture thickens enough to fully coat the back of a wooden spoon. 6. Strain the custard to remove any bits of eggs that may have curdled and stir in the vanilla. With fresh berries ... awesome! I know I'm being repetitive but in case you haven't read my earlier post, the best feature of a Liège waffle is that it can withstand whatever topping or sauce you serve it with- it just stays crunchy and delicious! I'm so happy with the way my waffles turned out! I'd be willing to get this "stuck" in my stomach....ohhh yeah! This is something I'm sure you'll enjoy like you did the regular one I made before. Absolutely brilliant! Liege waffles are one of those things that I LOVE, but don't make often. This just elevates it to a whole new level. I have some pearl sugar sitting at home, so I think I know what I will be making this weekend. I made these yesterday, and they were delicious! 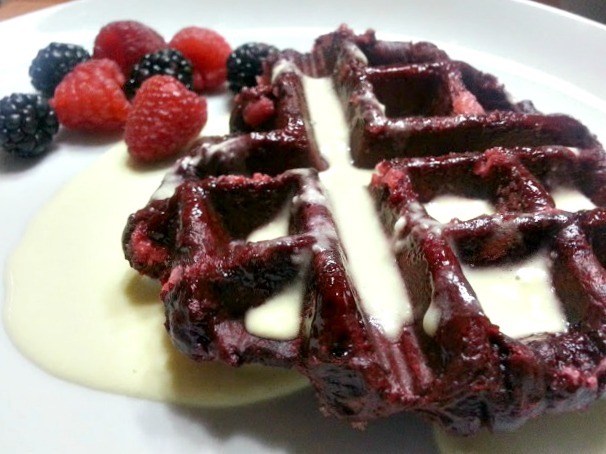 Still, I think I prefer the plain Liege waffles. I did get lazy and skip the creme anglaise, which probably could have changed my mind. I just didn't want to end up with all those leftover egg whites! Exactly my sentiment! It's actually the creme anglaise that made it delicious as in the case of anything red velvet- without the cream cheese frosting, it's not that great lol. That's also the reason why I add a little extra cocoa powder even when I make cupcakes; cakes; etc- without that chocolaty flavor and buttermilk to make it moist- I don't think it can stand alone unlike the plain Liege. 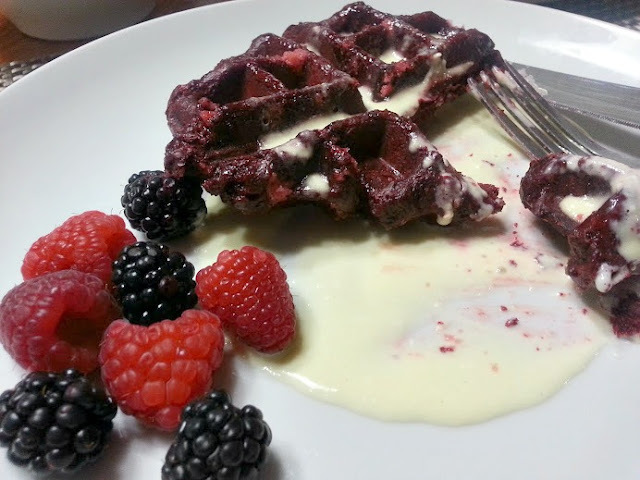 I had a Bit of a bitter taste, still came out good but i would like it to be sweet like a liege waffle... suggestion?